Eating L.A.: Would you go veggie for 30 days for GoodLA? Would you go veggie for 30 days for GoodLA? Good is doing some excellent work with its local Los Angeles community news and events. They support everything from food swaps to beer bike rides, and you can't argue with doing good. 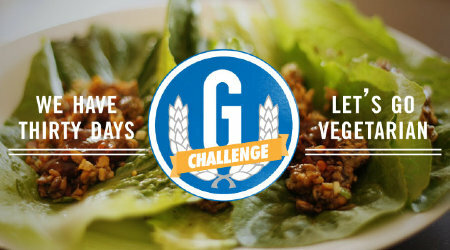 The magazine/integrated media platform emailed me to ask if I'd like to post about their June challenge, which is to go meat-free for 30 days to help save the planet. I'd love to support Good and all they do, but that's just too long for a foodblogger to go without carnitas, sushi and shortribs. Actually I don't eat much meat at all, but I feel better if I keep up a fairly steady supply of fish, poultry and the occasional pork belly-scallop skewer like last night at Moko. But I'll try to be mindful of choosing more sustainable poultry and meat this month, and maybe get a bit more ambitious with some vegetarian main dishes, just to be a good sport. Which is probably more than most foodbloggers would do, since they tend to skew thoroughly meatarian like this Ruth Bourdain graphic mocking the new government food recommendations. What do you think? Would you go meat-free for a month? Do you think it would make a significant environmental difference? I think it's ridiculous to say that it abandons your "foodie" nature to go meatless in LA for 30 days. Los Angeles is one of a few cities in the US where you can comfortably be vegetarian and still be part of a food revolution. Personally, I'm an omnivore that leans towards a vegetarian diet, and I will happily eat vegetarian for June to make a point that not only is it possible, it's delicious. I second the first person's comment. Hmmm... I will have to consider this. Only for the fact that maybe it will teach me to eat healthier? I would fall down laughing hysterically if asked that question a year ago. Take it from someone who ate meat no less than twice a day, every day, for his whole life when I say, the hardest part is deciding to try eating without it. Once you cut meat out and start exploring other foods that will satisfy, soon the need to feel filled or satisfied isn't always in the forefront of your mind. What sounds good to eat, or weird cravings for greens or things that your body is telling you it needs, start to drive your hunger. Kale, chickpeas, tempeh, might as well have been foreign words to me. Quitting meat is a life changer and I still love food.